23andMe sent an email to say that they received lots of kits at the same time as mine, and it will take them longer then usual to get around to the processing. Must have been a popular Christmas present. 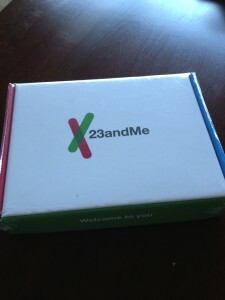 While I wait for analysis, I’m invited to familiarize myself with the 23andMe online experience by means of the Mendel family. This is a real family (but hidden behind Gregor Mendel’s name) of European extraction, whose DNA analysis serves as a typical sample of what the customer should expect to find when their data is loaded into their account. I find that Greg Mendel is probably lactose intolerant, but his spouse should not be, at least not for genetic reasons. This is what I looked for first, because it’s one of the things I’m looking forward to the most. This information is listed under Traits, along with a lot of other things that are interesting, but not life-changing. Well, that depends on how you feel about ice cream. Or eating broccoli (perception of bitterness). These are all things you already know about yourself when you’re 48. Or do you? In the case of lactose, you may be genetically OK for it, but have other issues preventing its digestion. If I’m lactase typical (and therefore lactose intolerant) it will be time to just stop torturing myself with the possibility of trying that new gelato shop around the corner from Helms Bakery. If it turns out lactose shouldn’t be a problem by virtue of my genes, I can try to find out what my limits are. Maybe it’s really beano I’ve been needing lately, not lactaid? There are lots of things in the Traits section I didn’t know about before. One’s level of caffeine addiction, for instance, and whether ear wax is wet or dry. I suppose some of this stuff would be good for parents to know. Why force kids to eat Brussels sprouts if the taste is truly offensive to them? Personally I was hoping to see olives listed somewhere, they are a food that really tastes disgusting to me, while my mom will happily eat a whole can during a holiday dinner. One of my cousins likes them, another doesn’t. That has to be a gene thing. Instead of olives, the list said “dark beer.” I love dark beer, even though it is unarguably on the bitter side. Maybe I can get 23andMe to add the olive question to one of their surveys or experiments. Not liking olives makes me feel guilty in a way that avoiding milk does not. Olives are supposed to be really delicious and good for you. On the other hand, broccoli and Brussels sprouts rank really high on my list of delicious, eat-raw-right-out-of-the-garden vegetables. So all these traits you can learn about are good for chit-chat over lunch. The next two categories of genetic destiny are a little more serious. I’ll save those for next time.